A great back splash can be a budget buster or, with some thought can be an inexpensive focal point. Adding an easy to clean and beautiful surface behind a sink or stove can be functional as well as attractive. Here are some inspiring photos to add some life to your kitchen or bathroom. White subway tile is a classic touch to add to a kitchen or bathroom. This rustic kitchen is very simple, the clean white tile as the back splash is a great contrast to the rough wood counter tops. 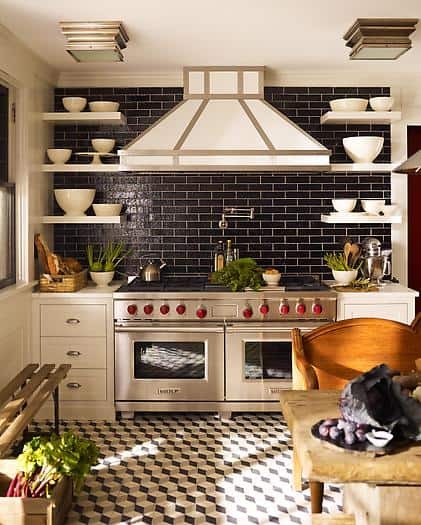 This kitchen is a nice mix of classic and modern, the funky floor tile works well with the handsome black subway tile. Also, keeping the cabinets, hood and accessories white really makes the tile and stove pop. This is one of my all time favorite back splashes, the drama of the marble against the tile is mesmerizing! Tin tile is something typically seen on ceilings but here the designer has used it as a back splash, although this kitchen has a modern feel the tin tile gives it a classic twist. This kitchen would look much more country with a different back splash but the chevron pattern really spices up the space. So since we can not all have the beautiful piece of marble featured in my favorite image, I encourage you to get creative by painting a piece of glass or simply picking a great tile and make it the focal point!